In today’s competitive oil and gas landscape, companies are looking for any advantage they can get to help them finish their projects on time and under budget. Unfortunately, many oil and gas leaders fail to recognize just how important it is for them to get their projects off on the right foot. When companies make an effort to start off a project right with pre-project planning based on complete and accurate land surveys, the rest of the project phases have a way of falling into place by themselves. Today we’ll discuss terrestrial 3D laser scanning, and how it can be an important tool in getting off to the best start possible with effective pre-project planning. While 3D laser scanning can play an important role throughout a construction project, it has many special advantages when it comes to pre-project planning. As a result, there’s really no reason that anyone should ever consider beginning an oil and gas construction project without first completing a 3D laser scan of the terrain. 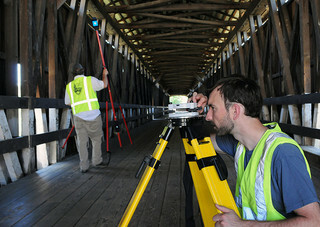 Simply put, 3D laser scanning is a process that involves bouncing laser beams off of a building or a piece of terrain. As the light points bounce back, the scanner collects data about the laser’s flight and integrates this data into a point cloud. Companies can then use this point cloud to create detailed 3D models that support pre-project planning. What Makes 3D Laser Scanning So Beneficial? The hallmarks of terrestrial laser scanning are that it allows land surveyors to complete extremely detailed scans of an area in a very quick period of time. Traditional land surveying methods take significantly more time to complete than 3D laser scans, meaning that they also cause delays in the beginning of the project. In addition, the surveys that traditional land surveyors create are nowhere near as detailed as those created by laser scans, and often require the surveyors to place themselves in harm’s way on dangerous terrain. After a team has a complete and accurate laser scan, they can begin working on the pre-project planning process with no delay. In addition to being quicker, 3D laser scans also support better decision making during the pre-project planning process. Team leaders will be able to make educated decisions about the best way to proceed with a project, while also feeling completely confident that their decisions are based on a complete and accurate understanding of the terrain as it actually exists, rather than the computer generated contours that go along with traditional surveying methods. 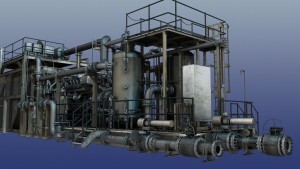 Finally, the accuracy and completeness provided by 3D laser scanning will prove to be an asset even when plans change. If, during the course of your pre-project planning, your team decides to move in a different direction with a project, you will most likely still be able to leverage information included in your original 3D laser scans, rather than having to take time out from your planning to complete additional measurements. 3D laser scans provide complete and detailed information that covers an entire area, meaning that you’ll never have to pay to bring surveyors out for another pre-planning site visit. Simply put, 3D laser scanning is the best way to ensure that your oil and gas project gets off to the right start, while also ensuring that your team will be prepared to adapt to any issues that may arise along the way. With 3D laser scanning, you can help make sure that your pre-project planning process is completed on time and under budget, setting you up nicely for a successful project. To learn more about how 3D laser scanning services from Landpoint can help your company conduct better pre-project planning, contact us today. Laser scanning has undeniably revolutionized the field of land surveying. The latest laser scanning technologies enable us to help our clients plan and execute the most efficient projects, and they allow customers to analyze every component of any facility or site. These capabilities help us make better decisions during every step of the project – from the planning stages through completion. The versatile technology can be applied to a variety of land surveying needs, including change detection, accident reconstruction, 3D drawing creation, pre-project scanning and more. In the past, field surveys could take days or even weeks to complete. Using laser scanning technology, it’s possible for us to complete the same field surveys in just one single day. Laser scanning also enables us to complete fly-throughs, 3D models, detailed animations and maintenance materials in less time than ever before. The increased speed and accuracy of laser scanning means that our survey team has to complete fewer field visits to collect data. This reduces the overall cost of a project for you. Laser scanning technology produces the most accurate data available. This solid knowledge base helps us help you plan better projects. We use laser scanning technologies in many aspects of land surveying. We rely on laser scanning for budgetary and timeline preparation, application implementation, historical preservation, reaching once-impossible areas, change detection, hazard surveying and accident reconstruction. We also use laser scanning to produce detailed topological maps, volumetric calculations, 2D drawings, 3D models and more. Overall, laser scanning helps us better understand building conditions, and this enables us to make better decisions regarding your projects. To learn more about laser scanner surveying and how it has changed the field of land surveying, contact our team today.